The Superscan III Model 112SP counterfeit detector, made by Cashscan, is a similar unit to the Superscan II, but is more cost efficient for applications requiring only a PC and not a built-in printer. Using several testing methods, including denomination recognition and multiple magnetic heads, the Superscan III is able to identify the note, verify its authenticity, and using OCR, record the serial number of the note, all in less than a second. The Superscan III can be interfaced with a PC or laptop to build a searchable database of scanned serial numbers. The Superscan III comes with an included 110/220 power supply. It requires minimal maintenance and is easily upgraded for future currency releases. Operates on a 110/220 switchable adapter and warrantied for one year, parts and labor. Dimensions: 8 1/2 inches x 4 1/2 inches x 3 1/4 inches. Weight: 3 lbs. 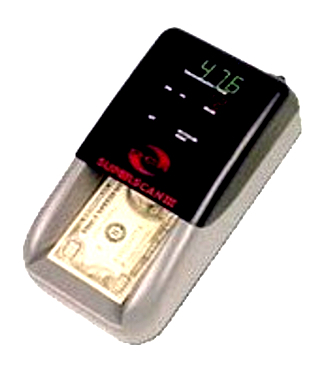 Superscan III Model 112SP counterfeit detector, made by Cashscan. Similar to the Superscan II, but is more cost efficient for applications requiring only a PC and not a built-in printer.